Kelly Elvin is the founder of TipTopTails Dog Training. Kelly has been coaching people and their dogs for over 18 years, and before that she practiced law for 10 years. She is a Certified Professional Dog Trainer-Knowledge Assessed, a professional member of the Association of Professional Dog Trainers, and a long-time board member and volunteer for Al-Van Humane Society. 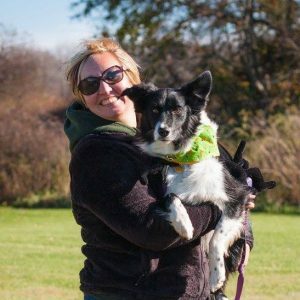 Kelly also is a certification instructor for the dog*biz Dog Walking Academy in Michigan, helping to teach professional dog walkers, pet sitters and dog daycare wranglers the skills to handle dogs safely and run a business successfully. Kelly believes that the primary goal of dog training is to have a dog you enjoy being around, so her training emphasizes practical skills for everyday life. She has a strong interest in early training and socialization to help puppies reach their full potential. Kelly has titled a dog in rally obedience and agility, and enjoys training her own dogs for fun in agility, disc, tricks and nose work. 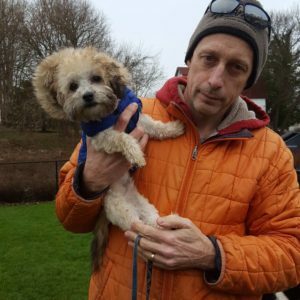 Matt Elvin has been a certified Missing Animal Response Technician since 2007 and offered lost pet recovery services after training a dog to search for lost cats. He studied under Kat Albrecht, founder of Missing Pet Partnership (MPP), and served on MPP’s Board of Directors for three years. Before becoming a dog trainer, Matt practiced law for 14 years. Matt has been teaching nose work classes since 2011 and enjoys helping dogs develop their natural scenting abilities and build confidence through nose work. Matt also helped develop and teaches TipTopTails’ innovative Puppy Day School and Tweener Day School programs, and is a certification instructor for the dog*tec Dog Walking Academy in Michigan, giving professional dog walkers the skills to handle dogs safely and to run a business successfully. Jessica Cefai loves to help her clients and their dogs learn new skills and build stronger relationships through teamwork. Jess has been teaching agility, puppy and good manners classes for six years, and has successfully competed with her dog in agility, dock jumping, and disc. Jess also is a wrangler at Camp Fido Dog Daycare and has extensive experience in dog-dog interactions and play behavior. She earned a B.S. in Zoology from Michigan State University, and worked as a zookeeper at Potter Park Zoo, where she was responsible for the enrichment and behavioral training of the river otters and assisted in training exercises with the Black Rhinos and Amur Tigers. Jess is a talented artist who enjoys creating hand-drawn and painted pet portraits from photographs. In her free time, Jess likes to relax with her husband, their Cattle Dog/Rat Terrier mix Bart, and their huge Ragdoll cat, Kiddy. Carolyn Dostal has been teaching classes since 1991 and brings a wealth of knowledge and experience to her students. Carolyn is an agility judge for UKC and CPE, and a Certified Nose Work Instructor through the National Association of Canine Scent Work. She has shown and titled dogs in UKC obedience, UKC agility, NADAC agility, USDAA agility, CPE agility, obedience, rally, conformation and nose work. Her dog Jodi was the first border terrier to be titled in AKC agility, and her beagles Miller and Pete currently compete in nose work, agility and conformation. Carolyn loves to make learning fun and motivating for dogs and handlers. Her enthusiasm for dog sports is contagious, and many of her students have successfully competed in agility and nose work, but she is equally happy teaching students who simply enjoy taking classes with their dogs. Holly O’Brien has seven years of experience working with clients and their dogs. Holly believes everyone has their idea of the “perfect dog,” and she loves helping clients to get their perfect dog with her gentle and effective training methods. Holly is a Certified Professional Dog Trainer-Knowledge Assessed (CPDT-KA), a Canine Good Citizen evaluator, and a member of the Association of Professional Dog Trainers and the Pet Professional Guild. She attends professional education seminars regularly to stay current on dog training and behavior so she can help her students achieve their goals. 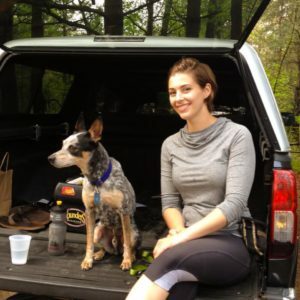 Holly is particularly interested in working with dogs with reactivity and other behavior issues, and is the lead instructor for our Reactive Rover class. 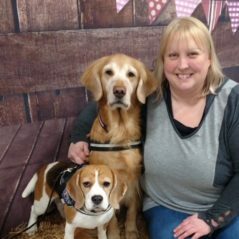 When she isn’t training dogs, Holly enjoys spending time with her husband, their little girl, and their dogs Lucy and Rosalind. 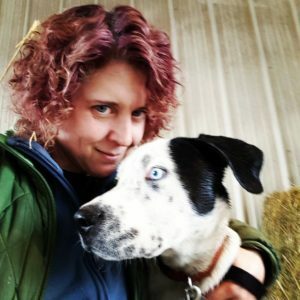 Becki Vander Weele’s dog training career began when she was 12 years old and started showing dogs in 4-H. To this day, competitive obedience is her favorite dog sport, and she also trains her dogs in nose work, conformation, rally, and bikejoring. 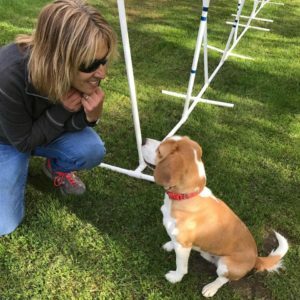 Becki brings her lifelong passion for dogs and training to her SuperDog dog sports foundation classes, and continually seeks out new and creative training ideas to share with her students. Outside of the training classroom, Becki has been a professional pet groomer for 21 years. 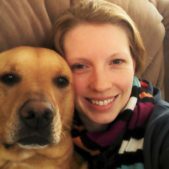 She shares her life with her golden retriever Darby and her beagle Bria. Beth Anglemyer is a very dedicated dog trainer and instructor. 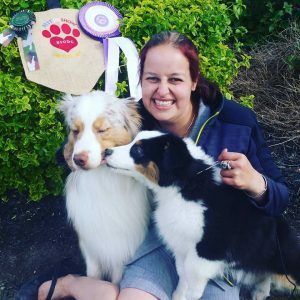 Starting in the Pee Wee showmanship program offered by the Australian Shepherd Dog Club of America, Beth has grown to develop a passion for not only training her own dogs, but also helping people learn how to train their dogs. Beth’s passion for helping others with their dogs started with being a Junior leader in the Cass County 4-H dog program. Beth has also enjoyed teaching public and private Obedience and Rally classes. Growing up in 4-H and dog sports, Beth enjoys training and competing in a variety of activities including Conformation, Agility, Obedience, Rally Obedience, Dock Jumping, Disc, and Weight Pull. Beth uses shaping and positive motivation to encourage dogs to work with and learn from their owners. It is her goal to not have every dog and handler team at the same level, but to have every dog and handler team at a level of understanding and working together to fit their individual needs. Beth says her favorite part about teaching is when you can see the connection build to that final “click” when the communication between the owner and dog becomes clear. When not teaching you can find Beth hanging out with her aussies or in her kayak. Karina Shaughnessy is an avid disc dogger who enjoys introducing dogs and their owners to the world of canine frisbee. 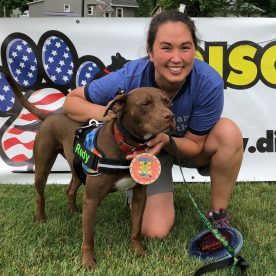 Karina believes that disc is the perfect way to build your relationship with your dog, help your dog develop impulse control and confidence, keep your dog in tip-top shape, and of course have fun! Tamiko has had a passion for dogs all her life, but really embraced training and dog behavior when she rescued her three pit bull mixes. Tamiko is particularly interested in working with kids and teaching them how to care for, play with, and respect their dogs and other dogs they meet. She has two young children who have been around rescue and foster dogs their whole lives. In her free time, Tamiko participates in disc competitions and dabbles in agility, nosework, and other dog sports. Two of Tamiko’s dogs are also certified therapy dogs, and she volunteers in local school and library reading programs in which kids read to the dogs. In addition to dog related activities, she enjoys spending time with her husband, kids, and her other pets including her rambunctious tortoise.